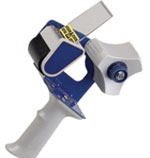 This tape gun / dispenser has a 3" core, which is becoming a more common size in the industry. The core measurement is the DIAMETOR across the inner circle of the roll. If you want to do a professional packing job, use a professional dispenser. The soft rubber grip is very comfortable in the hand, which heavily reduces any chance of hand blisters. This same tape dispenser is told to hundreds of professional movers around the country. If they like it, so will you. This item is packaged in a plain unbranded white box. Makes for a great retail item. A master case holds 12 dispensers. For each item purchased, buyer receives 1 dispenser. If you want 3 dispensers, buy 3 of this item.